The AT A Range of machine from GG are built and designed to work either as a stand alone machine or with integration in a line. 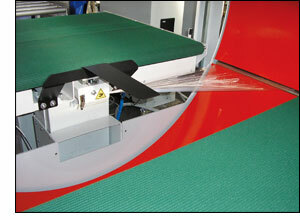 A large variety of components can be wrapped including products with differing sizes and shapes. Due to the various ring diameters within the range (620mm-2010mm) it is possible to wrap individual components, bundles of components or indeed completed furniture. The machines are flexible and simple in their use and are equipped with belt conveyors or motorized rollers, photocells for product detection and pneumatic vertical pressure in order to stabilize the product during the winding and banding. 8 pre written programs are available for various banding operations.